Jillian Spectre knows what happens after you die. She can be in two places at once. Problem is, her heart can only be in one. Supernatural abilities aside, she’s a typical high school senior torn between two guys. But that gets put on the back burner when she discovers the father she had long assumed was dead is actually alive, with unique powers of his own. He’s a technopath, with the ability to interface his mind with technology. And he’s got a plan to take down society. Unless Jillian can stop him. THE ADVENTURES OF JILLIAN SPECTRE is the story of a very special girl who learns that the power of love is more important than supernatural powers. The Adventures of Jillian Spectre is an exciting experience seen through the eyes of a seventeen year schoolgirl who has a special psychic talent. 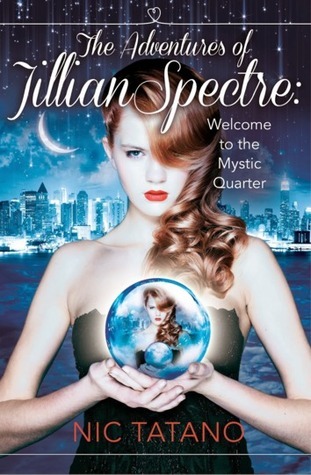 Jillian lives in the mystic quarter of New York and is a seer with defined powers pertaining to romance. When her psychic talents develop and her absent father appears Jillian’s adventures become life changing and apocalyptic. The story has strong, likeable characters and a fast paced plot. It portrays popular themes in original ways and contains a strong thread of humour which mindful of the intended audience counterbalances the dark themes explored. This sweet romance allows the reader glimpses into the conflicts faced by a teenage girl who helps the others with their love lives but can’t see what lies in store for her. The antagonist is a doubly dangerous since Jillian naturally wants to know her father yet must fight against the evil he threatens the world with. The ending is suspenseful and satisfying and leaves enough loose endings to make me want to read what happens next.